John III Sobieski (Jan III Sobieski): King of Poland 1674-1696; born 17 August 1629 in Olesko, the son of Jakub Sobieski (1580-1646) and Zofia Teofilia née Daniłowicz. John Sobieski became a military commander and after the death of Michał Korybut Wiśniowiecki (1640-1673), King of Poland, he was elected to the throne the following year. John III Sobieski died 17 June 1696 in Wilanów, Poland, and was succeeded by Augustus II. John III Sobieski protected Mennonite privileges and rights. When the voivode of Pomerelle promoted the expulsion of the Mennonites in the Marienburg parliament (1676) and in the Polish parliament, the provincial judge reported to the king the injury that would accrue to the economic welfare of Marienburg if this should happen. The king was convinced, and commanded that the constitution which had already been passed opposing the Mennonites, be destroyed, and in a rescript of 1678 gave them special protection. In addition to their original lands, others were now assigned to them. In 1694 the king reaffirmed all these rights, expressly designating that all the privileges granted by earlier kings should be extended to all the Mennonites living in the Werder. The regulation of 22 August 1694, read, "Since the Mennonites have shown great zeal to prove themselves deserving, it is fitting and proper to preserve to them all their rights, privileges, and customs, . . . and we will grant the free exercise of the Mennonite religion." In 1681 he saved the lace makers from oppression by the Danzig magistrates by reaffirming their former privileges. Hoop Scheffer, Jacob Gijsbert de. Inventaris der Archiefstukken berustende bij de Vereenigde Doopsgezinde Gemeente to Amsterdam, 2 vols. Amsterdam: Uitgegeven en ten geschenke aangeboden door den Kerkeraad dier Gemeente, 1883-1884: v. II, No. 697. Mannhardt, W. Die Wehrfreiheit der Altpreussischen Mennoniten. Marienburg, 1863: 87 ff. Neff, Christian and Richard D. Thiessen. "John III Sobieski, King of Poland (1629-1696)." Global Anabaptist Mennonite Encyclopedia Online. October 2007. Web. 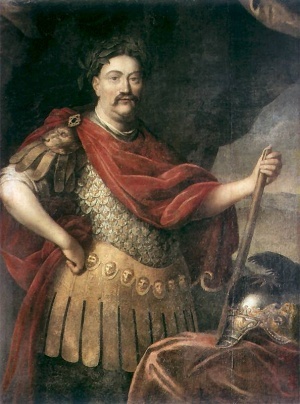 21 Apr 2019. http://gameo.org/index.php?title=John_III_Sobieski,_King_of_Poland_(1629-1696)&oldid=144186. Neff, Christian and Richard D. Thiessen. (October 2007). John III Sobieski, King of Poland (1629-1696). Global Anabaptist Mennonite Encyclopedia Online. Retrieved 21 April 2019, from http://gameo.org/index.php?title=John_III_Sobieski,_King_of_Poland_(1629-1696)&oldid=144186. Adapted by permission of Herald Press, Harrisonburg, Virginia, from Mennonite Encyclopedia, Vol. 3, p. 114. All rights reserved.